Elizabeth Bennett thought herself the luckiest woman alive the day she married her Darcy. Never mind the strange moods he occasionally falls into, or the surprising change of plans during their wedding tour that lead them traipsing around to France and Italy instead of relaxing at the Lake District. Mr. Darcy is perfect. But soon Elizabeth can no longer ignore the strange signs and the peculiar and oftentimes menacing behavior of some of his friends. The truth is huge and intimidating—can Elizabeth, who already went through so much just to simply marry Darcy, make their marriage survive despite their differences? 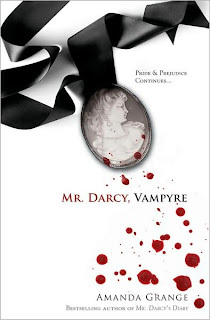 Mr. Darcy, Vampyre is a clever and fun romp. Amanda Grange's humorous book contains plenty of humor, history, and of course, vampyre lore, to satisfy both supernatural fans and the Austen fans. The novel isn't quite as dense as Austen's Pride and Prejudice, which makes it a nice pick if you wish to be entertained, but neither does her novel quite capture Austen's unique style. Mr. Darcy, Vampyre is especially fun as Elizabeth and Darcy travel all across Europe as it packs in many cultural and historical details and stays historically accurate. The ending wraps up nice and neat, with a few little surprises to keep the reader on the edge of the seat. This is an amusing and seamless sequel that is fascinating and entertaining, and you simply can’t help but admire Grange’s imagination. Cover Comments: This cover is a little bloody, but smart nonetheless, and it fits within the time period. I like how it's kept simple with the grays, blacks and white background. Very nice. Review copy received from Sourcebooks. Great review! I've been wanting to read this one for a while. Glad you liked it! I was wondering if it would just be a cheap parody to bring in the Austen crowd. I plan to read this in January. Mr. Darcy as a vampyre, that's gotta be a woot, I wanna read it!